Just by watching any Living Land episode, you will become aware that it takes a special team, with in-depth knowledge of agriculture and lots of passion to create vibrant, entertaining yet educational programmes. Nozipho Ndiweni, the owner and CEO of No-Line Communications, is the glue keeping this very diverse, artistic and hugely talented group of people together and inspired, in order to present the viewer with a brand new Living Land episode every week. Nozipho is Mama Living Land; always willing to listen, she believes there’s good in every human being and that by one step at a time, she can change the world! iSpani shares the many layers of employment and career planning with young, unemployed viewers. iSpani takes viewers into the world of work. For most school leavers, the world of work is hard to get into. The steps to entry level jobs are a mystery! iSpani shares the many types of employment and career plans available. Unemployed viewers trying to get onto the job market are exposed to a variety of career opportunities, looking at multiple industries with employment potential for those starting out. In each episode an aspiring careerist is exposed, in detail, to the inner workings of a specific career starting at the very bottom. They are taken on a process of orientation and practical job shadowing, introduced to and supported by potential employers. In addition to performing specific tasks that build the foundation of a competent employee, iSpani candidates are coached by on-the-ground experts in the field, who share their experiences in developing their own careers with the candidates. The Mathematical Genius in You is a ground-breaking, innovative and pragmatic dialogue between the author and the reader focused on how to achieve in mathematics. It is both motivational and instructional as it takes the reader through the steps on how to bring out the mathematical genius inside the reader. It is an easy read that anyone can go through and understand the principles required for maths success. The style of writing is simple, and plain English has been used so as to appeal to a wider audience. Learners who can read should be able to fully understand the concepts and principles of becoming mathematically proficient. SABC Education fully embraces and adopts the Decade of the Artisan programme which was launched by the Department of Higher Education and Training (DHET) in January 2014. The programme is a strategic vehicle for poverty alleviation through agrarian unemployment reduction as prescribed in the National Development Plan. Expansion of sustainable job opportunities for South African school leavers and the current unemployed citizens is at the fore-front of government’s priorities, thus the Decade of the Artisan programme is pivotal to the attainment of government’s goals. 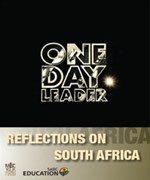 SABC Education has published a book ‘One Day Leader’ written by previous participants of the One Day Leader television show who share their views on critical elements of South African life, namely race and culture, citizenship, entrepreneurship, education, gender equality, healthcare, poverty and leadership. Anyone who watched the television series One Day Leader knows that new leaders are born all over South Africa in communities with and without resources. These leaders are determined individuals, ready to defend their views in a debate, to take on new ideas and will go out of their way to serve their communities. 48 Hours is a magazine series that prepares students in the last three grades of the senior phase for higher learning and helps them to make informed career choices in fields fairly unknown, particularly, in previously disadvantaged communities. The series also impacts on other learning areas including, but not limited to, the process of career decision making, the difference between textbook knowledge and practice. 48 Hours is designed to bring the world of careers to young South Africans. Pupils spend 48 Hours on the job with different professionals; they take on basic chores, learning and asking as much as possible. 48 Hours showcases various professions including artisan and mainstream careers, each episode culminating in inspiration from an entrepreneur in the field. It’s for Life develops life skills by helping candidates realise their social, personal and professional potential. It’s for Life inspires viewers to take control of their lives and take cognisance of the fact that self-motivation, self-esteem and self-actualisation is important in producing the human resources we need in this country. The series primarily advances the career possibilities and growth of potential young adults in our diverse and challenging South Africa. It’s for Life gives viewers food for thought and entertainment. It’s for Life is innovative and motivational; it develops a mindset that we are the architects of our development. Women in Science, a six part documentary series is about ordinary women doing extra-ordinary things in some of the world’s most cutting edge areas of research; space science, synthetic biology and palaeoanthropology right here in South Africa. The series tells stories of women who through passion and relentless hard work have become involved in scientific domains, sometimes without any formal science training. Each show visits a different science context and exposes the multi-faceted work that takes place here. We meet women who are charting the edges of our vast universe, and others who are imaging the interior of a single cell; from mind-blowing big to the impossibly small.